The weather in the forest has been a little unpredictable this week, with what has felt like all four seasons arriving all in one day. 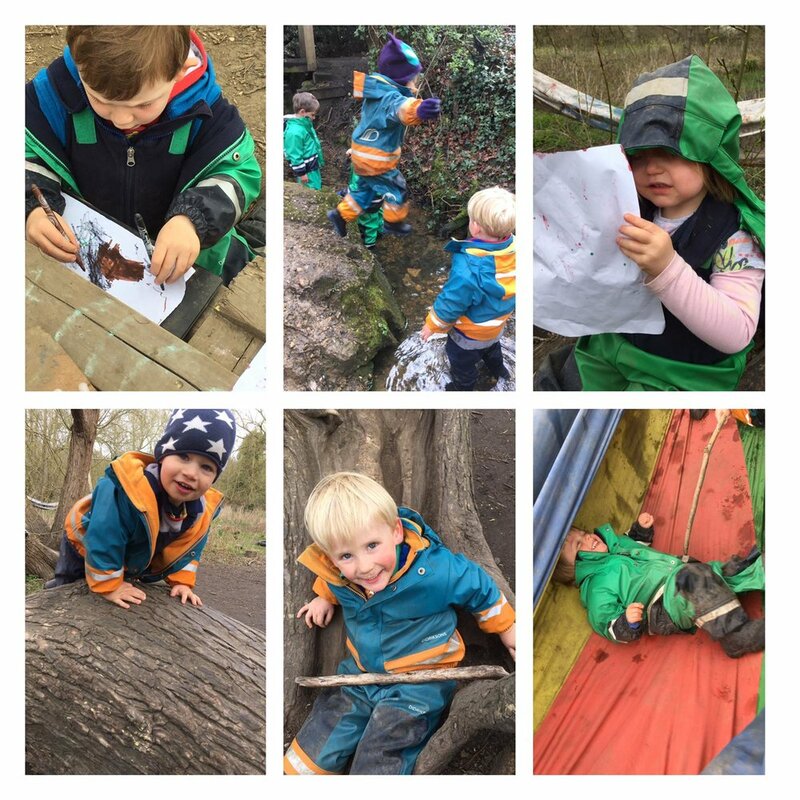 This has not stopped our Little Forest Folk-ers playing and exploring as they have changed from hats and gloves, to high viz vests, and back to waterproof jackets to ensure they are ready for play no matter the weather! Educators have been building a lot of tarp shelters this week and a group of children watched in fascination as one educator put some sticks into the ground, around which they tied guy ropes to keep the shelter nice and taut. We then noticed children in their imaginary play imitating what they had seen - one child in particular was pretending to be an educator explaining to the other children what he was doing as he drove a stick into the ground, fetched some rope and proceeded to explain to them how to tie a knot, "This goes around, then put this through this and go around again". There have been other times this week where children have taken on the role as 'educator' - Spike was pretending to be stuck between two branches in a tree and two children were trying to demonstrate and give him instructions on how to use his arms to lift his body up. Both children were being really encouraging and using some fantastic communication in order to verbalise their instructions to him. There are many theories that suggest children learn a lot of their behaviour through imitating the adults who are special to them and it is heart-warming to see that many of the children are putting behaviours such as being supportive, helpful and sharing skills into action in their play. That said, as bonds between educators and children strengthen, children also like to develop their sense of humour and jokes and we have seen them putting this into practice in their relationships with educators this week too. One child was taking their jacket off at the toilet and asked Christie to hang it on the toilet tent. Looking up at it she then gave a cheeky grin and said, "Look Christie, my coat is so high, Xiao won't be able to reach it! "...it is fair to say that Xiao is not the tallest crayon in the box but what he lacks in height he makes up for in sense of humour. Some of our newest children have now reached that point where they are becoming so confident in their play and explorations of the forest. One child was building a car with some tyres and a pallet and watching how they navigated the space, seeking out resources with a fixed intention in mind and working alongside others with less and less concern for where their key worker was at the time, demonstrates a real milestone in their emotional development as they successfully make that transition into Little Forest Folk life. It is not just children that have to go through transitions, Virginia who has been a fundamental member of Team Wimbledon had her last day in the forest this week and the children have enjoyed making a fuss of her and saying goodbye. They understand she still works for Little Forest Folk but will be joining the new team at Twickenham and they know they will see her again (hopefully soon) and the children and staff wish her all the best in her new team who are so lucky to have her! We hope you have a nice weekend and let's hope the weather suits your weekend plans!